The Walk Event Chair(s) serves as the volunteer leader of the Event Committee for the fundraising, planning and execution of the Autism Speaks Kansas City Walk. The Walk Chair works closely with the Staff to ensure that plans for the event are successfully executed to meet Walk Goals. Help identify and organize volunteers and current team captains to recruit new team captains. Help to re-engage teams and participants from the previous years and coach them in fundraising. Identifies opportunities to engage the business community in our mission through Walk. Help identify new opportunities and strengthen existing relationships. Will look for opportunities to expand corporate supporters into year-round partners and secure new sponsorships. Identifies opportunities to engage the local schools in our mission through Walk. Help identify new opportunities and strengthen existing relationships. Identifies opportunities to maximize event fundraising efforts. Ensure Team Captains, Participants, and Committee members have the tools and resources they need to fundraise successfully. 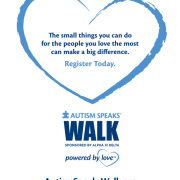 The Marketing and Outreach Lead(s) generates greater participation for the Walk via promotion of the event and to build public awareness for Autism Speaks in promotion of Walk. The Logistics Chair serves as the primary lead for coordinating day of event logistical needs and helps secure in-kind donations for participants such as water, coffee, fruit and granola bars. The Grand Club Lead (s) focuses on securing catering donations and other vendors to create a VIP experience for our top donors and teams in the Grand Club/Team Village area of the Walk. The Volunteer Lead(s) helps recruit and train day of event volunteers to ensure a smooth, delightful event for participants and volunteers at Walk. The Mission Lead(s) identifies opportunities to connect the community and our participants to the mission during the entire walk season and facilitates Walk day mission activities for the program such as special speakers, musicians with autism, and other entertainers. We meet monthly at a central location. A passion for Autism Speaks and the Kansas City community.